A man is working at a standup desk in an office where he works because standing is healthier than sitting all day. Live healthy, donât sit all day. I am standing at my desk right now, as I type this article. If you think you know why, you are partly right. About a year ago, headlines proclaiming sitting to be the new smoking proliferated across the Internet. So, if this is the reason you think I stand at my desk, you are partly right. In fact, sitting too long is only one of several health risks that writers like me face, most of which are shared by anyone sitting all day in front of a computer screen (or a TV screen, or a tablet or phone, for that matter). But there are other reasons to stand. Standing gives you energy. Have you ever noticed that if you lounge all day in front of the TV, you feel tired. You feel lackluster. Inert. Lethargic (not in the clinical sense). You did nothing all day, but you feel tired. Standing gives you more energy than sitting. And when you stand, you'll find yourself shifting your weight. Those little movements make a huge difference in your energy level. With energy come a whole lot of additional benefits. Standing is better than a diet. Not only does standing keep me from feeling that mid-afternoon grogginess, but it helps me keep control of what I eat. Why? Because when we feel groggy, when we lack energy, we tend to seek food to compensate. Food gives energy, right? Standing at my desk in the afternoon probably reduces my calorie intake by 100 to 250 per day. And those tend to be useless carb calories. Plus, standing burns more calories. Here's a calorie counter to see just how much you'll burn by standing instead of sitting. Standing is better for your back. Watch the coders, the editors, the graphic designers slumping in their chairs. Most people have horrible posture at the office, and that can really hurt your back. When we stand, we tend to have better posture. The one caveat is to raise your keyboard and screen high enough that you don't slouch. Standing puts you in control. Posture makes a big difference in how we interact with our environment. When we sit, we are more passive than when we stand. If we sit and slouch in our seat, sliding half-way under our desks (you know what I'm talking about! ), we become incredibly passive. On the other hand, when we stand, we become proactive. We tend to take control. I am sure that if we surveyed some of the most successful people we know, we would find that they don't stay seated behind their desks. They get up. They walk around. They move. They take control of what they are doing. Standing keeps you awake. Maybe you have and maybe you haven't, but many people have literally fallen asleep at their desks, especially in mid-afternoon. Ah, the siesta hour! I've never quite fallen asleep. At least, I've never snored loudly enough to wake other sleepers up. But I know I get groggy. My thinking slows. My actions slow. I lose at least 10 percent productivity, probably a lot more most of the time. So standing in the afternoon has particular benefits. Standing boosts productivity. What standing specifically does at any time of day is make us more focused. If you work anywhere within spitting distance of social media, staying focused can sometimes be a challenge. Standing reduces the likelihood that you will take a moment to watch a YouTube video or ooh and ah at a silly picture on Facebook. 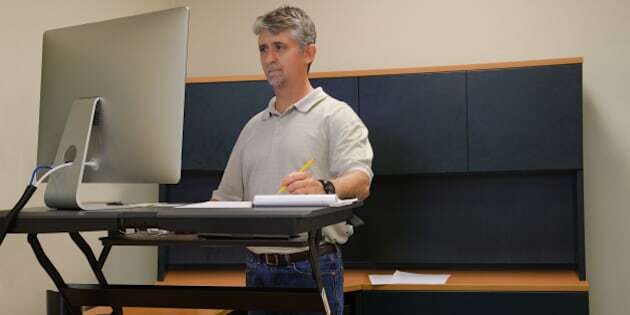 A study reported a few months ago in Huffington Post reported that 70 per cent of federal employees found their productivity increased when given standing desks. Standing makes you more creative. This should come as no surprise. Creativity takes energy. People think more creatively when they stand, and even more so when they move about a room, whether that means pacing or flitting from screen to board to desk. Standing is a boon for our health and for our productivity. It helps us stay focused, keep from feeling groggy and be more creative. Nobody wants to stand all the time, but standing at least as much as we sit can make a huge difference to our success in life, in so many ways.